but leaked air around the wood comb which made them play inconsistantly. heard of this at one time or another. These musicians would soak their harps to get better tone. reeds and inducing corrosion on the reedplates. won’t do anything except make them corrode and wear out quicker. combs so the wood expansion is no longer an issue. have your harmonica for a long time. 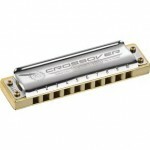 The question I get asked the most is how to figure out what blues harp or harmonica to use when playing with a band. I have made a chart that takes all the guessing out of this. Don’t be the guy on the bandstand frantically testing out harmonicas trying to figure which is the correct harp to use. Simply follow my handy chart and print it out if you like and put it in your harp case so you always have a reference. Click the button “Cross harp Chart” at the top of this page or simply follow this link to the easiest to follow chart to help you figure out what harmonica to use when playing with a band or other musician such as a guitar player.